India and China have a long history of border disputes, which is not unexpected from two growing world powers with thousands of miles of shared borders. The basis for most of their conflicting claims date back to a time when India was still part of the United Kingdom and China was still ruled by a Qing emperor. These disputes have periodically devolved into clashes and, on one notable month-long occasion in 1962, war. As the two countries have developed and grown as global powers, so too has their ability to use diplomatic means to resolve these disputes. For example, in the spring of 2015, the two countries were able to defuse a border dispute in the Ladakh region through a series of talks. India and China have decades of experience deescalating border disputes, so why are they struggling now? Chinese foreign policy is deliberate. Each move is intended to project their power to the world, ensure domestic stability, and secure party power. The escalation of border tensions in this area was not inevitable, but likely a carefully planned and executed move to further Chinese policy objectives. This particular dispute is not a new one. China and Bhutan do not even have official diplomatic relations due in part to their inability to agree on boundaries for their shared borders. Although a border dispute focused on an area only a couple of square kilometers in size may seem inconsequential, analysis of the situation, and the timing, can give us insight into China’s larger goals and shed light on their international, domestic, and party objectives. In order to analyze China’s objectives in this situation it is necessary to understand a complicating factor, the involvement of a third party, the tiny Himalayan Kingdom of Bhutan. Overshadowed by the two growing superpowers, Bhutan is an easily overlooked aspect of this dispute. This is not a typical border conflict between India and China. In fact, their shared border in this area is defined and undisputed. 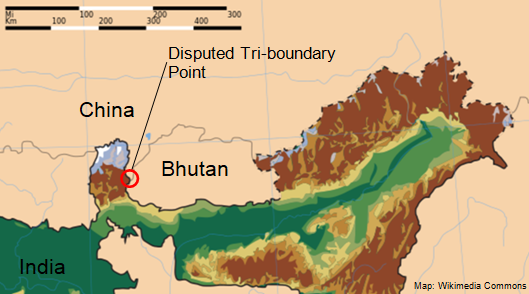 This is a dispute between China and Bhutan (supported by India) over the tri-boundary point, or the point at which the three countries’ borders meet. This particular disagreement has its roots in a 19th century treaty between British India and the Qing government. None of the involved parties question the validity of the treaty, but instead have conflicting interpretations of the accords. Bhutan and India maintain that the tri-boundary point is located at Batang-la, four kilometers north of Doka La pass, the site of the current standoff. China asserts the point is two-and-a-half kilometers south of the pass, at Mount Gipmochi, which would make the contested construction site (described below) well within their bounds. According to Ankit Panda, a senior editor at The Diplomat, “both countries [have] reasonable claims.” This is due to contradictory phrases in the original border agreement and even, possibly, incorrect surveying during the 1800s. India claims it intervened at Bhutan’s request after Chinese troops began constructing a road in Bhutanese territory. China’s account of the incident differs in that it is Indian troops who are out of bounds. Bhutan has no official diplomatic relationship with China, but its relationship with India is very strong. India is Bhutan’s largest provider of aid, supports the Bhutanese military, and still directs much of Bhutan’s foreign policy from New Delhi. India has been acting as a mediator for these reasons, as well as for its own strategic purposes. India has reacted so strongly to abnormal Chinese military activity in this region because of its geographic significance. This area is close to a strip of territory called the “Chicken Neck,” which connects India to its far reaching northeastern states. Because of that strip of land, those states are vulnerable, making its security paramount. India is also concerned about rising Chinese military activity in the Indian Ocean. In early June 2017, just days before the standoff started, China began operating its first overseas military base in Djibouti, on the horn of Africa. There has also been a reported uptick in the number of Chinese military ships operating in the Indian Ocean, possibly in response to recent naval exercises India conducted with the U.S. and Japan. Beyond feeling threatened geographically, India has other worries when it comes to increasing Chinese power. China has also been strengthening its trade relationships with countries in the region through its One Belt One Road (OBOR) initiative. India, notably, did not attend a recent summit for the initiative. This makes India one of the few countries in the region avoiding involvement. One of China’ s first projects through OBOR is a “China-Pakistan Economic Corridor” which has improved relations between two of India’s biggest rivals. This cooperation has riled nationalistic sentiment in India, particularly after reports China will be developing parts of Pakistani-administrated Kashmir, another territorial dispute that India is involved in. China also has reasons for not backing down on this particular border dispute. China has been testing the limits of their geopolitical power throughout the region, though most efforts have been focused in the South China Sea. Throughout the dispute over Doka La Pass, China has repeated the familiar refrains of the “indisputable fact” that the pass has “always been a part of China.” Backing down now may weaken China’s other territorial claims, particularly those close to Doka La Pass. China’s claims to the area between Tibet and India, Arunachal Pradesh, are contested by India. The Tibetan spiritual leader, the Dalai Lama, is also a sticking point in the Sino-India relationship. India incited China’s fury when it gave the Dalai Lama asylum following the failed Tibetan rebellion in the late 1950s. India’s cooperation with the Dalai Lama continues to rile Chinese politicians, most recently when the spiritual leader visited Arunachal Pradesh with Indian officials. There are many underlying tensions between China and India aggravating this situation, but it is doubtful that the dispute will escalate much further. While it would be disastrous for politicians on either side to initiate armed conflict, the shield beating is beneficial for garnering the support of their own people by playing on nationalistic sentiments. Both benefit from aggravating the other, but neither would gain from initiating an armed conflict. It would be best for both sides to pull upon their decades of experience deescalating tense border disputes and resolve the disagreement quietly.